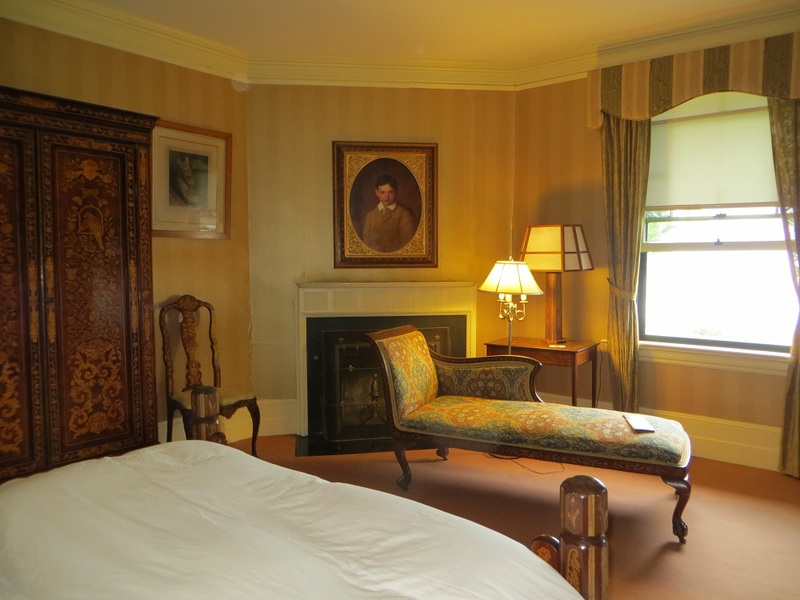 I walked into the Inn at Shelburne Farms in Vermont and found it exactly as I’d left it, over 20 years before. 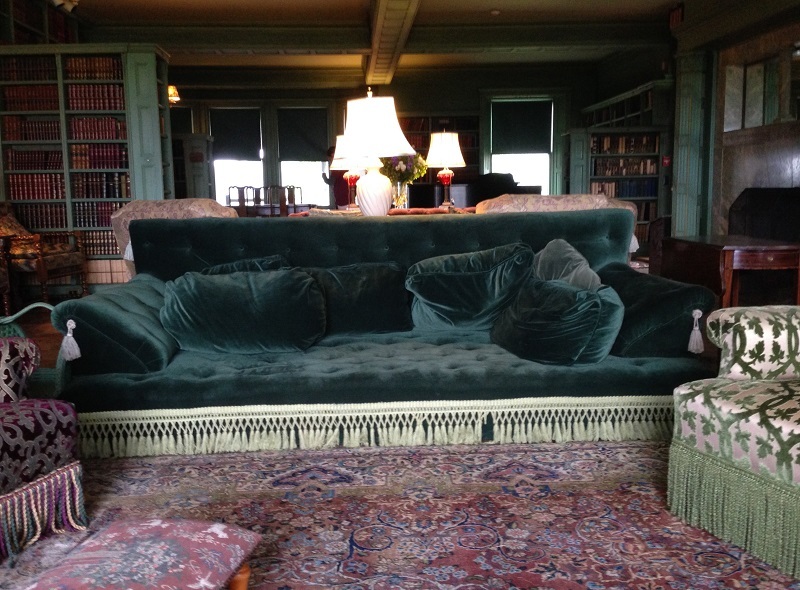 The dark green velvet sofa (rather lumpy, because it’s been in the house since 1899), the huge family portraits, the marble fireplace, the spectacular view of Lake Champlain and the Adirondacks beyond. And the feeling that I’d just walked into an F. Scott Fitzgerald novel. 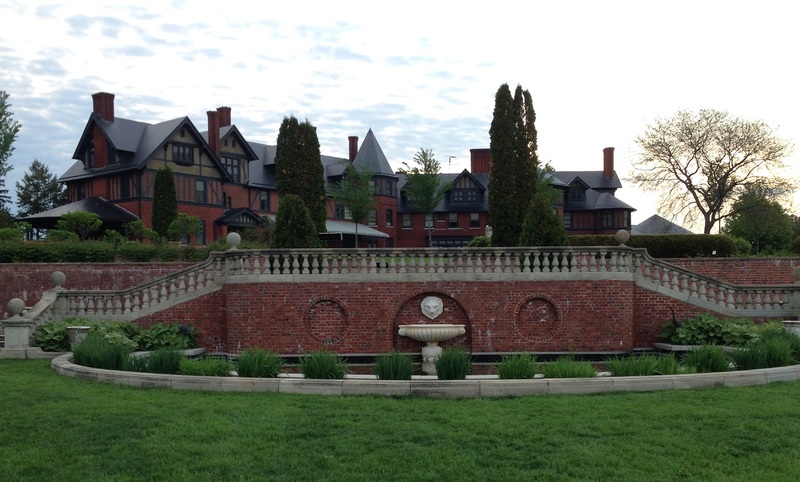 The inn had once been the home of Lila Vanderbilt and her husband, William Steward Webb. Her name comes first because it was her inheritance that financed the purchase of the 3800 acres for the farm in 1886 and the construction of the house in 1899. William Webb was a physician who, at the behest of his in-laws, became a finance and railroad executive (because…a doctor in the family…the horror of it!). Robert Henderson Robertson designed the buildings; Frederick Law Olmsted designed the landscape. Fun family facts: Lila’s brother, George, built the Biltmore in Asheville, North Carolina. Electra, of the Shelburne Museum, married Lila and William’s eldest son. Twentieth century descendants struggled to keep up the farm and in 1972, they turn it into a nonprofit focusing on sustainable farming education. The house was restored and became an inn in 1987. I stayed at the inn at least once a summer for several summers during the 1990s. We swam and canoed in bitter cold Lake Champlain, played Killer Croquet (that was our savage, take-no-prisoners version of the genteel lawn game), and wandered their many acres, communing with the cows and other farm animals. The charm of the inn — especially for history tourists and would-be Daisy Buchanans — is that much of it remains as it was when the Webbs lived there. It’s like staying in a house museum. Going up the ornately carved staircase and past the Arnold and Locke stained glass windows (how I know that they’re Arnold and Locke, I’ll tell you later), I find my name on the door at the top of the stairs, as if I were a family guest there for a house party. 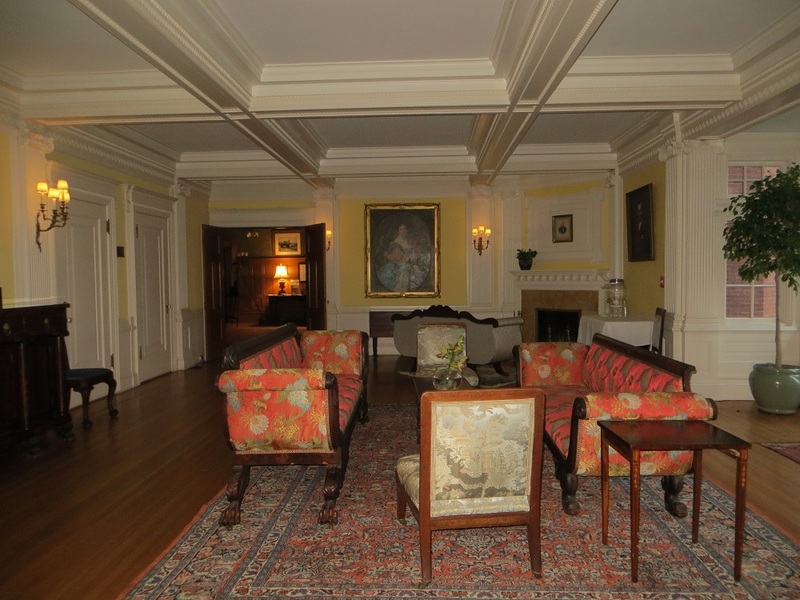 We were in the Brown Room, which once belonged to Vanderbilt Webb, Lila’s youngest son. 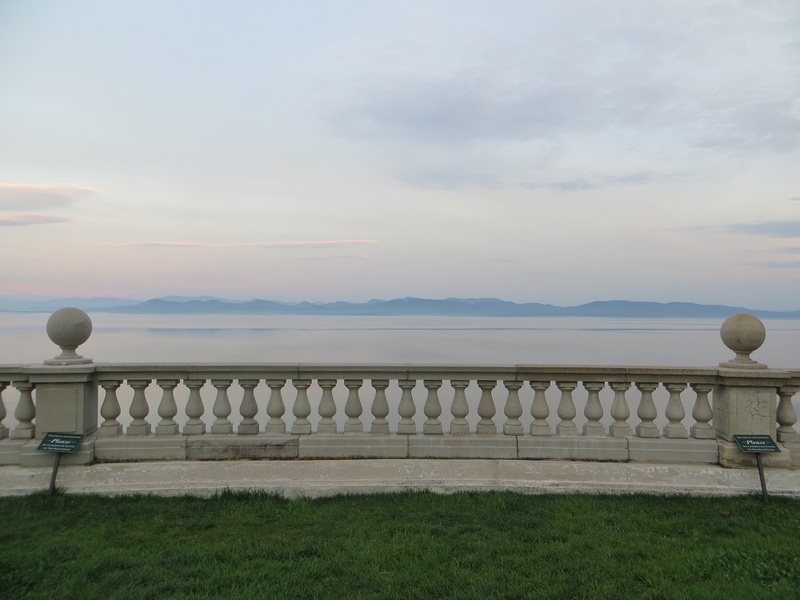 His portrait was above the fireplace and the room contains, to quote their website, “marquetry furniture that features sycamore and holly inlaid in mahogany.” Our windows open to the same garden, lake, mountain progression as the public rooms below. The furniture, the paintings, the objects — all belonged to the Webbs when Shelburne was their summer house and it remains there now, furnishing the inn. When we asked the receptionist about the objects, she got out a binder with photographs and descriptions of some of the major pieces. It was, she told us, to be used by the staff as a reference, when guests asked about the furnishings. Since we wanted to know about every single item in the house, she handed us the binder and allowed us to take it away. We spent a fun morning wandering the entire house, searching for and identifying objects (which weren’t always where the binder said that they were). I’d highly recommending asking for the binder, then poking your noses everywhere. The doors to unoccupied guest rooms are kept open. Adding to the feeling that you’re a Webb guest in the early years of the 20th century: there is no climate control, television or elevators. 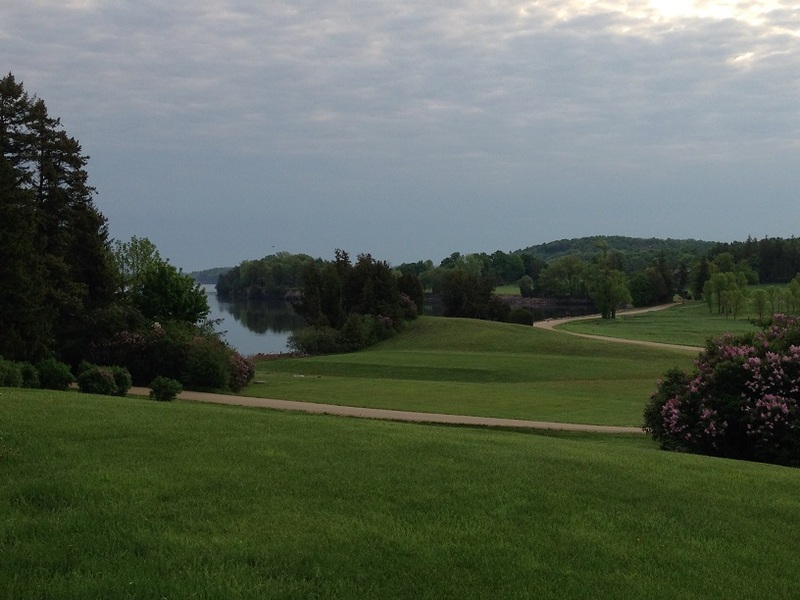 Cooling breezes off the lake and oscillating fans are the only form of air conditioning available. The inn closes for the winter. We picked up soup, sandwiches, wine and one of the best chocolate cupcakes I’ve ever hand, from Harrington’s of Vermont, along the 2 minutes of road we traveled between the Shelburne Museum and the inn. We thought we’d take it into the garden and have a picnic, but were too exhausted and ate in the room. Since that involved reclining on a chaise lounge as I sipped my Rhine, I’m not complaining. There’s a public restaurant at the inn that serves breakfast and dinner. We had breakfast there the next morning — fine but nothing to write about. As beautiful as the house is, the farm is just as lovely, so we tried to squeeze in some time — we were only at the inn for one night — to see it. We made a quick drive-by to the farm barn, where we watched them make cheese (they’re a working dairy farm with Brown Swiss Cows) and got up close to some animals. A leisurely walk or a brisk run on their miles of trails would have been nice, but there was no time for that on our hit-and-run tour of New England. Oh well. It gives me a reason to make these visits an annual — and longer — event again. Gallery | This entry was posted in Vermont and tagged Inn at Shelburne Farms, Lila Vanderbilt Webb, William Stewart Webb. Bookmark the permalink. I thought your opening par sounded rather like a novel. Linky no worky for me. The bedroom looks very elegant, beautiful marquetry. The green velvet sofa, however, looks horrible. In fact that room looks to be a total mish mash of colours and patterns all clashing together. LOL — maybe I was inspired while thinking of F. Scott. I tried to correct the link. Hope it works now. The interesting thing about the house is that it doesn’t come off as too decorated. The mish mash of style and colors sort of added to the feeling that we were in a family home, where generations of members added to the furnishing — all very expensive, but not necessary harmonious to the 21st century eye. There was some Neo-Georgian, some Arts and Crafts and Art Nouveau, some Edwardian, most late Victorian. It does work. Using the odd bit of initiative and wasted half the morning looking at every bedroom (partly the decorating really!) and generally reading all the website. Think they could have made a bit more effort for vegetarian breakfasts instead of just an omelette. The website said there was wifi by the way. Did it not work or have they stopped it? I had a vegetable omelet. It was okay, but they’re a farm, so I expected something…better. And what really disappointment me was their bread. Hard, dry and soulless. They probably would have whipped up a veggie-based breakfast, had we asked. I have no idea why I assumed that they didn’t have wifi. I can’t even remember if I might have used it. Now I must go and revise my text. Thanks for pointing that out. I find breakfast a difficult meal. I like something unusual. Can’t bear veggie versions of a greasy fry, I like my own baked beans – but only mine, I used to do a veg kedgeree quite often, I’d forgotten that. It was good though (used tofu). I quite like any leftovers from the previous day too. If I ate fish I’d probably go for kippers or smoked salmon. But I don’t. As a meat eater, a mixed grill was nice – minute steak, lamb cutlet, kidneys. At the other extreme I love fruit, or fruit salad. I’m obviously in my editing mood. I spent most of yesterday working on a book. I usually check links anyway, and point them out because I’m always grateful to people who point out any probs with my blogs. As for the wifi, I just remembered what you’d said. It’s only in the main house but that’s where you were staying, so I thought worth a query. I love leftovers for breakfast. I don’t eat beef or pork, but I eat seafood. I have kippers every morning when I’m in England but for whatever reason, it isn’t readily available in the states. I don’t think Americans are big on fish (except for smoked salmon) for breakfast — we’re a more highly-sugared dry cereal kind of country. Cheese toast is a breakfast staple, as is oatmeal and yogurt mixed with lots of fruit (in the summer when its good) and nuts. I’d really have to think hard if I were a vegan, though. Beans at any time are good, as are fruits (local and in season — hate tasteless, imported winter fruit) and tofu. Writing a book or editing a book? Right now I tend to have fruit early on, and then a brunch. I’ve got some (un sugared) muesli which I eat once in a blue moon, but it’s really just to pad out the soya milk. Freelance editing. I like working directly with authors but I’m also on the lists of a few publishing houses to try and widen my market. With my professional background in journalism, writing, proofing, editing, publishing etc, it seemed a sensible way to go. Typically, it’s the sort of world where everyone thinks they can write, and everyone thinks they can edit. But I can afford to keep prices low, and I can work from home and set my T&Cs. So, it suits. Editing seems like an interesting but difficult profession — telling someone that their baby isn’t as perfect as they thought. I hope the manuscripts you have to read are tolerable. What a fun place to stay! I actually think that it’s my all-time favorite hotel.